Acer's Android powered tablet is looking at a Q4 launch? We've been hearing a lot of things regarding Android powered smartphones from Acer, but now we're beginning to see the faint beginnings of their foray into the tablet world. Just like how we see the Android army continue its assault in the cell phone market, they're slowly amassing an army as well for the tablet sector. 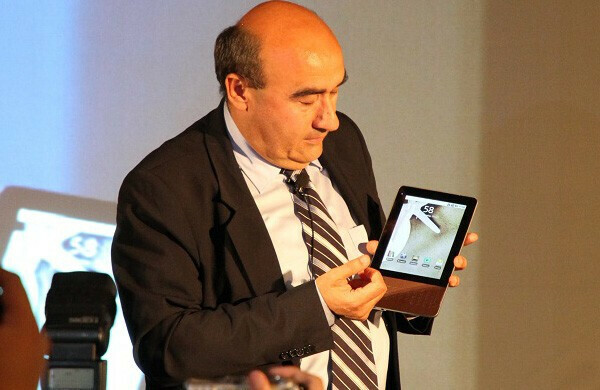 There was a recent press event held in Beijing by Acer where their CEO, Gianfranco Lanci, unveiled their 7” Android powered tablet. Their stance in joining the tablet game definitely changed as they witnessed their Android handsets becoming prevalent in the market – so it would make sense for them to jump aboard and attack the market with their own Android tablet as well. Although specs and information surrounding the device was at a minimum, Lanci did hint to a fourth quarter release with the possibility of some carriers taking part – which would mean that it would probably come packed with a 3G modem inside. This is great to see and you have to figure it will not be locked to any one GSM carrier. "7 inches is fine with me, 10 inches is a bit massive." - That's-not-what-she-said! !